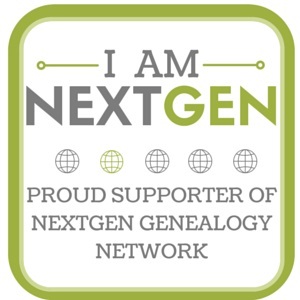 I wrote another post for the website Genealogists.com last week. Some of you may be familiar with the story of Roscoe’s great uncle William B. Schwartz. I used William as an example of an ancestor with a criminal past and some of the records needed to discover these fascinating stories. This week I submitted an article on using land records in your research. Stay tuned! This entry was posted in William B. Schwartz and tagged criminals, genealogy on December 11, 2014 by Deborah Sweeney. In December 1915, William B. Schwartz died. He was buried on 16 December 1915. I am currently in the process of ordering William’s death certificate and the burial records from Crown Hill Cemetery in Indianapolis. Mary Victoria died a few years later in 1918. Both are buried in unmarked graves, in adjoining plots, at Crown Hill Cemetery. I have been unable thus far to find an obituary for William. Perhaps once I have a definite death date for William, I may be able to have better luck finding an obituary. I have tracked down two personal court cases in which William B. Schwartz was involved. The first case was from 1901 in which he was the plaintiff; the second was from 1906 in which he was the defendant. I will begin transcribing and posting from these two cases this week. I will post more information as I discover it, but at this point, what I have of William B. Schwartz’s story has been told. I still haven’t made up my mind whether he was truly a scoundrel or a man caught up in life’s misfortunes. You can visit William B. Schwartz’s memorial at Find A Grave. This entry was posted in Genealogy, Schwartz, William B. Schwartz and tagged Mary Victoria (Wheeler) Schwartz, William B. Schwartz on May 12, 2014 by Deborah Sweeney. 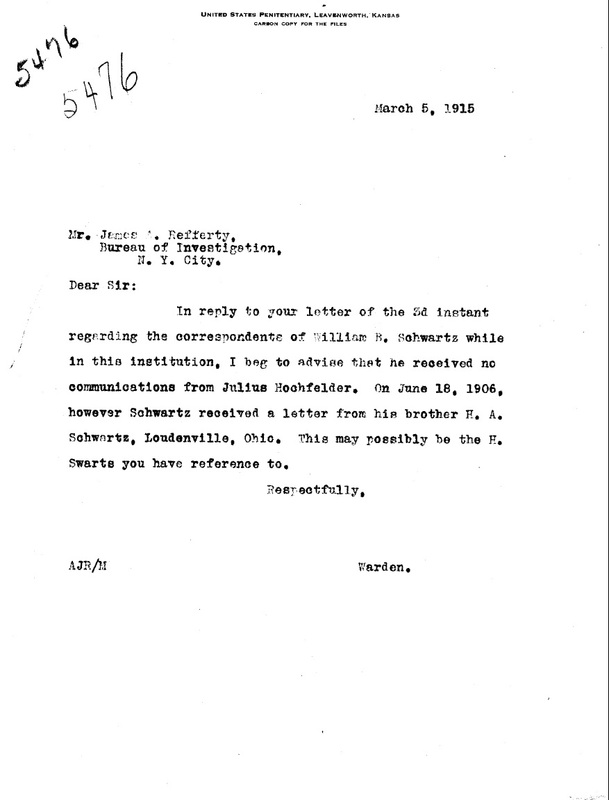 In reply to your letter of the 3d instant regarding the correspondence of William B. Schwartz while in this institution, I beg to advise that he received no communications from Julius Hochfelder. On June 18, 1906, however Schwartz received a letter from his brother H. A. Schwartz, Loudenville, Ohio. This may possibly be the H. Swarts you have reference to. 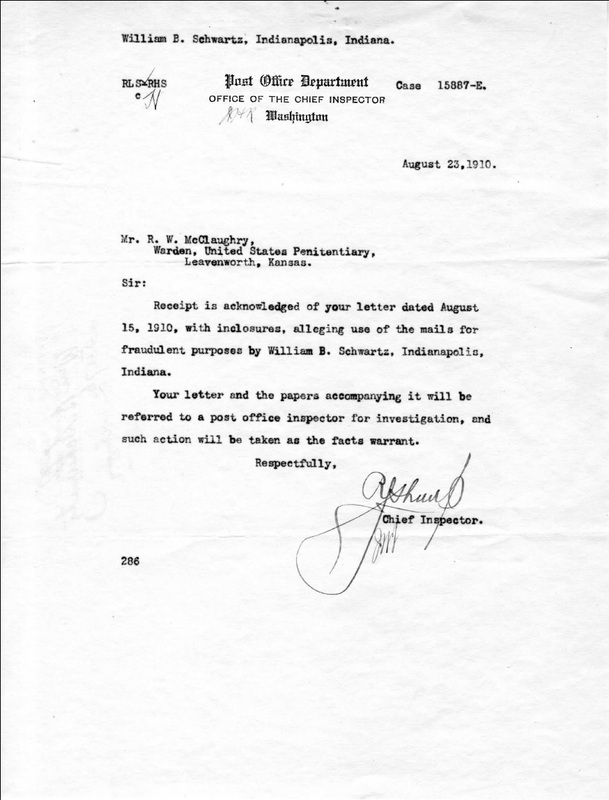 Letter from Warden, R. W. McClaughry, to Jas. 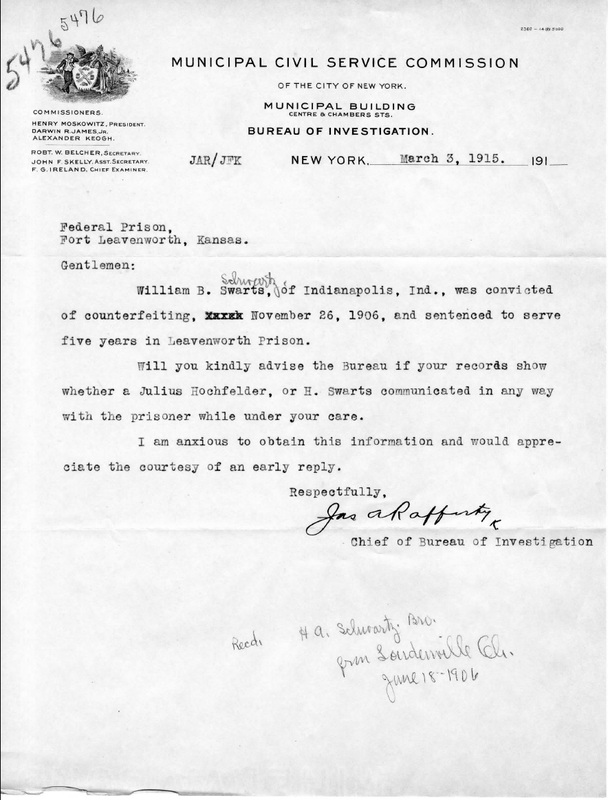 A. Rafferty, Chief of Bureau of Investigations, 5 March 1915, William B. Schwartz, Prisoner no. 5476; Inmate Case Files, U. S. Penitentiary, Leavenworth, Kansas, 1895-1931, Record Group 129; National Archives at Kansas City, Missouri. 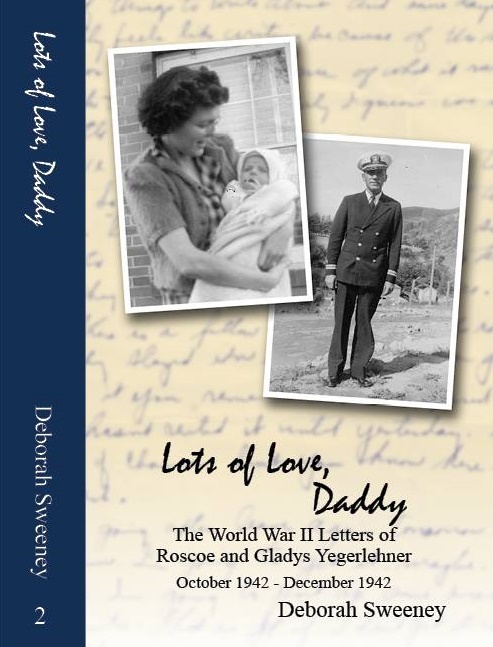 This entry was posted in Genealogy, Schwartz, William B. Schwartz and tagged Dr. Henry A. Schwartz, Fort Leavenworth, James A. Rafferty, Julius Hochfelder, R. W. McClaughry, robert, William B. Schwartz on May 11, 2014 by Deborah Sweeney. William B. Swarts (Schwartz), of Indianapolis, Ind., was convicted of counterfeiting, xxxxx November 26, 1906, and sentenced to serve five years in Leavenworth Prison. Will you kindly advise the Bureau if your records show whether a Julius Hochfelder, or H. Swarts communicated in any way with the prisoner while under your care. I am anxious to obtain this information and would appreciated the courtesy of an early reply. Recd. H. A. Schwartz, Bro. Letter from Chief of Bureau of Investigation, Jas. A. Rafferty, to Warden, R. W. McClaughry, 3 March 1915, William B. Schwartz, Prisoner no. 5476; Inmate Case Files, U. S. Penitentiary, Leavenworth, Kansas, 1895-1931, Record Group 129; National Archives at Kansas City, Missouri. This entry was posted in Genealogy, Schwartz, William B. Schwartz and tagged Dr. Henry A. Schwartz, Fort Leavenworth, James A. Rafferty, Julius Hochfelder, William B. Schwartz on May 10, 2014 by Deborah Sweeney. William B. Schwartz, Indianapolis, Indiana. Receipt is acknowledged of your letter dated August 15, 1910, with inclosures, alleging use of the mails for fraudulent purposes by William B. Schwartz, Indianapolis, Indiana. Your letter and the papers accompanying it will be referred to a post office inspector for investigation, and such action will be taken as the facts warrant. Letter from Chief Post Office Inspector, Robert S. Sharp, to Warden, R. W. McClaughry, 23 August 1910, William B. Schwartz, Prisoner no. 5476; Inmate Case Files, U. S. Penitentiary, Leavenworth, Kansas, 1895-1931, Record Group 129; National Archives at Kansas City, Missouri. This entry was posted in Genealogy, Schwartz, William B. Schwartz and tagged Chief Post Office Inspector, Indiana, Indianapolis, Robert S. Sharp, William B. Schwartz on May 9, 2014 by Deborah Sweeney. The address is different, and the intial B. has been dropped from the name in the 1914 directory, but I believe it is the same W. B. Schwartz. How many William Schwartz, lawyer, can there be in Indianapolis in 1914? “U.S. 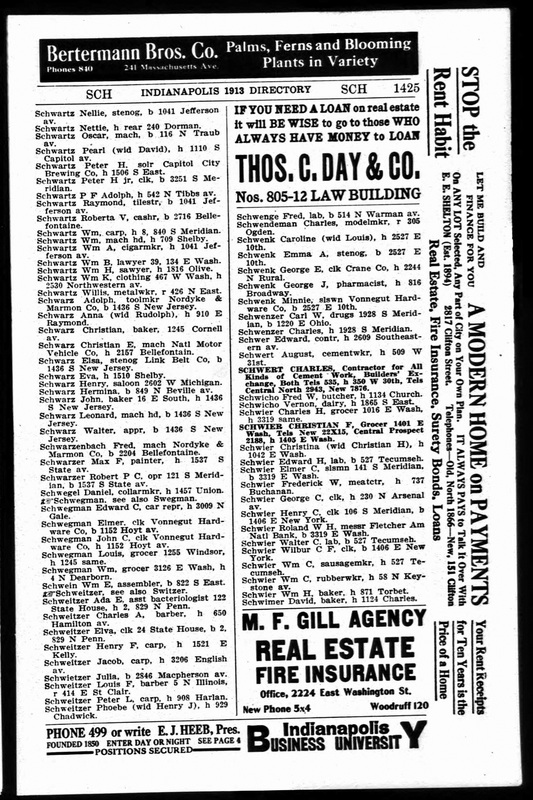 City Directories, 1821-1989,” digital image, Ancestry.com (http://www.ancestry.com : accessed 6 May 2014), Indianapolis (1914), Wm Schwartz. This entry was posted in Genealogy, Schwartz, William B. Schwartz and tagged Indiana, Indianapolis, William B. Schwartz on May 7, 2014 by Deborah Sweeney. By the end of 1913, Roberta married Ralph H. Edwards. William continued to work as a lawyer. “U.S. 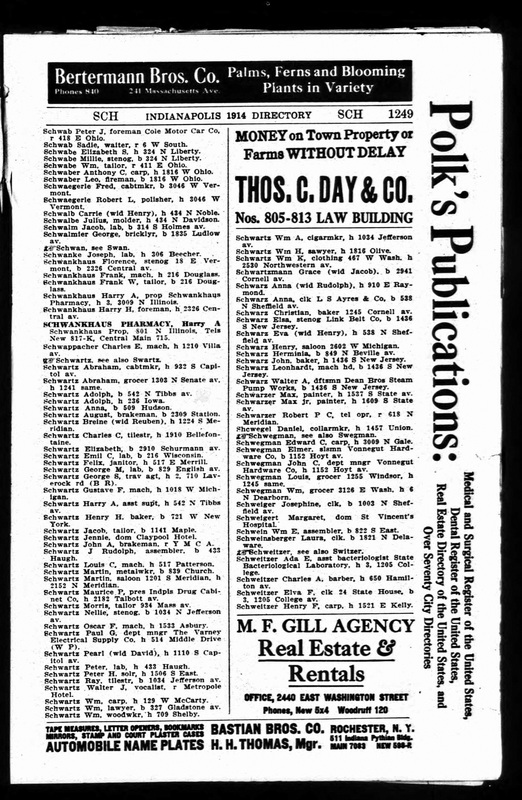 City Directories, 1821-1989,” digital image, Ancestry.com (http://www.ancestry.com : accessed 5 May 2014), Indianapolis (1913), Wm B. Schwartz and Roberta V. Schwartz. This entry was posted in Genealogy, Schwartz, William B. Schwartz and tagged Indiana, Indianapolis, Roberta V. Schwartz, William B. Schwartz on May 6, 2014 by Deborah Sweeney.